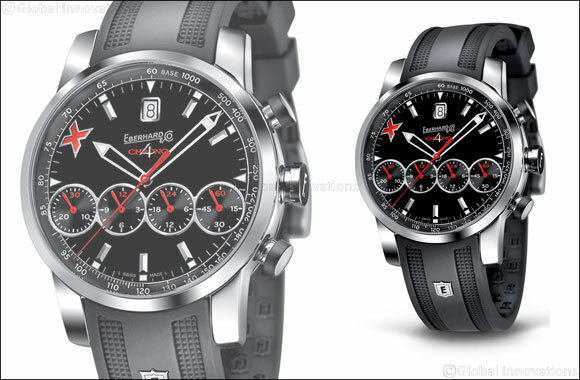 Eberhard & Co continues to come up with new iterations of their innovative Chrono 4 line of outsize watches embedded with a motorsports theme, The latest edition in the line of oversized chronographs is the Chrono 4 Grande Taille in a limited edition of 500 pieces. With a black stainless steel case and black rubber strap, the Chrono 4 Grande Taille exudes a dynamic and sporting look, proudly carrying the E motif on the side. The generously dimensioned case (43mm) hides a mechanical movement with automatic winding. Like all the other Chrono4 models by Eberhard & Co. it is characterized by an exclusive feature: its four counters are arranged in a horizontal row, which makes reading the time a logical and consequent operation. The display follows a natural progression of time: minutes and hours hand, 24 hours and small seconds hand.